THE CWF Eastern Ontario Turtle ProjectThe Eastern Ontario Turtle Project launched in 2017 and is being delivered by Canadian Wildlife Federation staff based in Ottawa. So far, 55 km2 of wetland habitat has been newly protected as a result of Blanding’s Turtle surveys. or open water on your property? 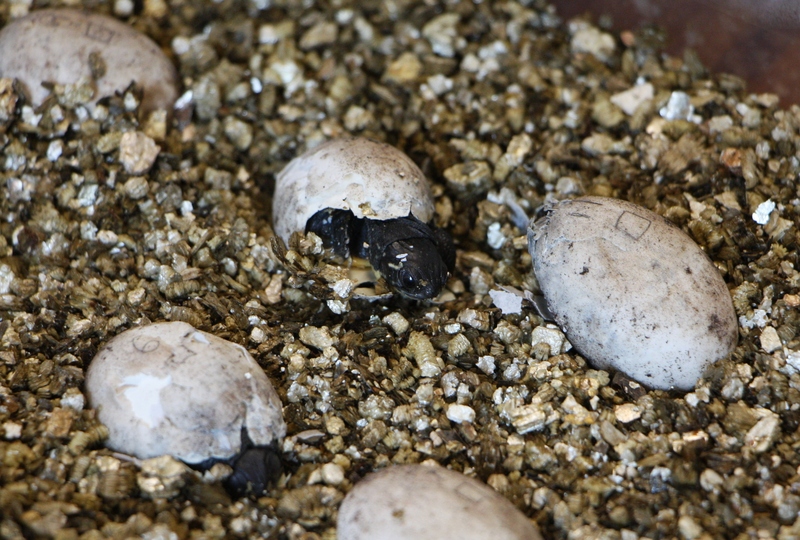 The Blanding’s Turtle is a species at risk in Ontario. Identifying additional wetlands with this species can result in habitat protection for those wetlands and nearby wetlands. To help with the process of finding new locations, the Canadian Wildlife Federation will be conducting wetland surveys for the Blanding’s Turtle this May and June. If you are a landowner in eastern Ontario and have wetlands on your land would you be interested in letting us survey for Blanding’s Turtles? Ideally we are looking for areas with extensive wetlands such as cattail marshes or treed swamps. We would conduct a one day survey at a time that is convenient for you. Our turtle team of two to four people would survey in and around wetlands looking for Blanding’s Turtles. We are specifically looking for properties in Lanark, Leeds & Grenville, Prescott & Russell, Stormont, Dundas & Glengarry, and Renfrew counties as well as rural areas of Ottawa. If you are interested or have more questions please contact us by filling out the form below. We will check to see if there are previously reported Blanding’s Turtle’s new your property. If your property would represent a new location we will be in touch to arrange a survey date. As a thank you to all participating landowners, we will provide a list of all species of amphibians and reptiles observed during the survey to each landowner. The location of any Blanding’s Turtle observed will be reported to the Ontario Ministry of Natural Resources and Forestry. This will result in habitat protection being applied to the wetland in question and possibly other nearby wetlands. Such habitat protection would not affect any day to day usage of the land but would prohibit the destruction of the wetland. The summer of 2018 saw the CWF Eastern Ontario Turtle Project expand its work in the greater Ottawa area. Road mortality remained a leading cause of death for the region’s at-risk turtle populations. Of the 645 turtles found on roads in the Ottawa area, 574 were found dead – including 68 endangered Blanding’s Turtles. CWF staff excavated nests and incubated 10 Snapping Turtle and seven Blanding’s Turtle nests at our CWF head office in Kanata. We released 396 hatchlings from eggs we incubated and 430 in total (we brought Snapping Turtle nests we had excavated to Rideau Valley Wildlife Sanctuary when our incubator was full and released those hatchlings as well). There was a lot of excitement and support from all staff in the Kanata office. We coordinated three staff releases, giving 22 staff members (plus our four turtle team staff) the wonderful experience of releasing turtles back into the wild and seeing our Science team in action. A key focus of our work in this area is to locate additional sites with the Blanding’s Turtle, a threatened species. Simply finding the elusive Blanding’s Turtle can help protect wetlands for a variety of species. In Ontario, locating a single Blanding’s turtle triggers legal protection of all suitable wetlands within up to two kilometres of the occurrence. Locating these individuals therefore is a critical first step in protecting the species and its habitat. Part of our work in the Ottawa area will involve identifying important nesting areas for turtles. Protecting turtle nests is critical for two reasons. Firstly, nest predation can be extremely high in certain areas so locating these nests and protecting them either by caging or excavating and incubating eggs is of great benefit to the population. Raccoons and other nest predators dig up and eat many of these eggs. In some areas Raccoons capture almost all of the eggs, threatening turtles. Caging these nests can keep out predators and protect the eggs until they hatch. Secondly, nests of Threatened or Endangered turtles result in more stringent legal protection in the immediate vicinity of the nest. 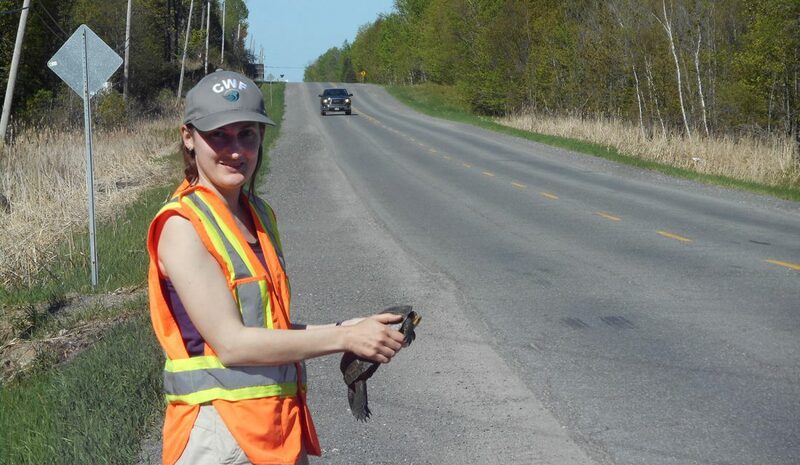 In the first month of our work in the Ottawa area, we found over 200 turtles lost to road mortality. Sadly, 40 of these were Blanding’s turtles. Roads are a primary threat to turtles, which is why we are conducting road surveys to identify areas with high concentrations of road mortality. While we all depend upon roads to get where we want to go, we can also make roads safer for wildlife. Fences and crossing structures under roads can allow turtles and other wildlife to get where they want to go. The project will carry out survey and analysis of road mortality to determine these hotspots. Where hotspots are identified, project staff will assess sites for mitigation suitability and preferred methods. These will then be presented to municipal councils for consideration by municipal government for the installation of mitigation measures such as exclusion fencing, culverts, etc. The public has a major role to play in turtle protection. With primary threats being road mortality and habitat loss, the community can directly help through safe driving practices and reporting sightings to trigger habitat protection and conserve wetlands. The project will continue to engage the local communities through awareness campaigns, presentations, community events and Turtle Blitz events. We are also conducting road surveys to find areas with high levels of turtle road mortality. While we all depend upon roads to get where we want to go, we can also make roads safer for wildlife. Fences and crossing structures under roads can allow turtles and other wildlife to get where they want to go. Part of our work in the Ottawa area will involve identifying important nesting areas for turtles. Raccoons and other nest predators dig up and eat many of these eggs. In some areas Raccoons capture almost all of the eggs, threatening turtles. Caging these nests can keep out predators and protect the eggs until they hatch.